I received an email from Wietse . He is doing well and his cats are settling in Holland (The Netherlands). I really miss his conversations and his advice. Summer had a bath today, turned out she was white under all that muck. She gets very mucky a lot more than other white dogs. She likes to be scruffy it seems. I have got her a ball just for her walks on the common. She loves chasing after it through the puddles and horse muck. She will not be clean for long. No physio today as Vel is ill. I could have really done with it as well. My neck is so tight. I have bean getting a lot of head pain shooting from my neck. It feels like some one has got my head in a vice. My balance is not very good either. My temperature changes are bad. I hope Vel feels better very soon. A lot of wrist and elbow pain, in fact as the day wore on I had pain most places. Sick and dizzy feeling, more so on standing. My knees have swollen up and are very painful. My body is mixed up part hot, part cold; very cold like ice. Despite taking a lot extra pain relief the pain refuses to budge. Oh the joys of RSD. When I have a lot of pain it is better and less painful to keep moving around. When I sit the pain is worse. A lot of this is FIBROMYALGIA I think mixed in with the RSD. Not a good night PAIN, BURNING and SPASMS. Cleaned up downstairs to try to work off the pain but it did not work. Made my friend a cake for her Birthday. The cake turned out very nice. I made one last week for another friend and she said it was very nice. I hope this one will be as good. Bed about 5am too much pain to go before. A bit better night still burning and cold but a little less pain. Pilates was painful did the best I could, Some times I look around and see how much the others have progressed. I feel like I am stuck at the beginning. RSD has robbed me of so much. I have a very big cold sore on my lip and inside my mouth very sore and painful I think the RSD has picked up on it. Run down I think. Andrew has bean in a lot of pain also the last few days with toothache. A dentist has diagnosed an infection and he has got antibiotics. I hope it does the trick. Awake at 7am. The lighter morning are waking me up now even if I have only bean in bed a short while. A little less pain I think but some days its hard to tell as it starts and stops like a train. Physio today - A good massage and my neck and shoulders feel a lot better. Vel said as from next week I will be having home visits for awhile - how long he does not know. The new building is mostly finished at a cost of 16 million pounds. But there is not a place for out patients physio at the moment. I feel very rough this morning sore throat and a bad head ache not the one I have bean getting recently though. All my joints hurt. Lindsay and the boys are here. We decided to go to the park across the road it was such a nice day neither Lindsay nor I feel too good but at least the boys can run around and have fun. 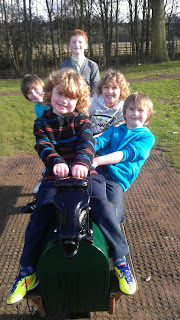 There is a new horse ride there the same type, as when Wayne, Lindsay and Andrew were little. They had a ride on it. Yee Har ride 'em cowboy. The park has had most good things taken away, health and safety ruined all the fun.. Doing a few bits in the garden when my body will let me. A lot of spasms everywhere, balance not right, I feel like I have a head cold. Went out for tea to a Chinese restaurant. It was very good but I have little appetite and I feel sick a lot of the time. Andrew is coming home for a few days to have some dentist work done. So some thing to look forward to at least. Andrew arrived at about 8pm Paul picked him up from the Airport. He had a good flight. Summer was very excited lots of high fives and jumping up and down. Wayne is coming here Wednesday, so all the family will be together again for a few days. Andrew at the dentist They filled a tooth and ten minutes later it dropped out. He went back but they could not redo it as they was not enough time they said. As the anaesthetic wore off Andrew was in a lot of pain as the nerve was exposed. I rung up and said he was coming back to have it redone, time or not..
After it was refilled they told him the first one was only a temporary one. When he asked why, they said time and cost. Surely it worked out more cost and time in the end. He is back tomorrow for more treatment. I hope this goes better. Fair session still hurts to do a lot of the moves. Told one of my friends is very ill and in Hospital. I feel sick and very sad. I hope she picks up soon. Wayne has arrived from Halifax. So nice to have him here. Andrew has had his treatment finished now, a tooth on a plate to replace one that came out. The cost of it all £204. Chinese take away for tea, six adults and two children. Nice to be together again. I did not feel too good though a lot of pain everywhere, really bad head. In town for a bit of shopping and a new case for Andrew, the airlines have just about destroyed the last one. Had a very nice dinner at Subway. Wayne had to go back home as he had work the next day. A lot of walking, but later on less pain than the day be for. This RSD makes no sense at all. Vel came and did a massage on my neck and shoulders. I told him how I had bean. I asked him how long he thought these home visits would last. He did not know but hopefully awhile. He has now got another room. The clinic there for out patients is closed and they are just doing physio for the wards. I don't mind either way so long as I get some treatment. The Pain Clinic have rung up Three times now to offer this LADIOCAINE INFUSIONS that I did not want as not enough is know as to the effects on the RSD. I do not want it to get any worse than it is. I asked about the ACUPUNCTURE that I was promised in early April, they do not know if I will still get it. I can have an appointment to discuss further treatment thought with the same Doctor that told me I needed STEROIDS for a condition that I did not have. I refused. I already know what works - ACUPUNCTURE. A sad day Andrew is going back to Amsterdam but it has bean good. He gave me a teddy for Mothers Day, Best Mum. Very sweet. Lindsay and the boys are here as well. Andrew set off with Paul to the Airport and we all said our good byes. I don't know when we will see each other again. Its not cheap to come across. Paul is going to see Wayne as Andrew is going from Leeds Airport not too far from Wayne's house. Paul will have a rest there then make the journey back home. Andrew has arrived safe back in Amsterdam and Paul is back home . Seems very quite here now. Mothers Day-- I got five cards, one from my son in law with some flowers, He said for his Special (Needs) Mum!!!. Thank you Will. One each from my three children and one from my grandchildren Jay-Jay and Tommy-lee. I also got the teddy I have already mentioned, a mug and sweets and some money so I was well treated. Not good today a lot of pain and bad spasms. I have to be careful how I move as the spasms come on at the slightest thing. Balance not good either. Andrew told me last night that his new tooth plate has broke it lasted less than four days. I have bean in touch with the dentist but will have to wait till the dentist who did the work comes back from holiday in about two weeks. He can still use it but not as well. Not a good bit of work. Pilates- Not good I feel like every one is improving but me most have gone on to more advanced moves. I still feel like I am stuck at the beginning. Jo said at least I can do some. I just want to be like everyone else. I get frustrated when I can't do want I want to do. I know some times I do too much but that's when I feel my best. As soon as I start to relax or want to rest that's when I get most of the pain. I am in quite a lot of pain and burning today, that does not help. Balance not good light headed. Hopefully I can soon sort out some long term ACUPUNCTURE. Later on in the day I felt worse the pain and burning did not stop despite taking a lot of pills including higher dose MORPHINE that I had from be for. That just made me itch. 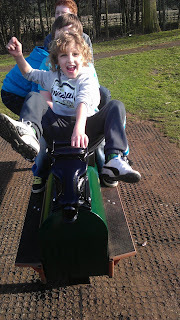 I felt more unsteady on my feet, not really any balance at all. slurring my words. I feel like I am on the outside looking in. My head was throbbing. I felt sick, kept burping and lots of PAIN. All my joints have swollen up, my knees are so big so are my elbows. Neck is swollen also. My legs are red hot but feel ice cold to touch. I would normally have a bath and this would help the joints but I dare not because of the burning. Even my teeth hurt. Later on I was sick. It was early hours of the morning before I felt any better at all. This is not a new thing this happens a lot. There is so much going on in my body no wonder it breaks down. I worry that the strong drugs I take cover up any things like a virus or pain that my body will not normally pick up on. A lot of the time I know I should be on higher strength drugs but I am reluctant to take them. If I can get by with out them I will. RSD messes with my life and does not care. Well Physio tomorrow-- Vel will be able to help I am sure. Well a bit better day pain still in joints some I did not realise I had. Temperature changes all over the place. Balance not good. Some one on the common asked me If I was drunk. It feels like it sometimes, may be I should drink and compare the difference. I had a letter from the Pain clinic saying that I had got appointments for ACUPUNCTURE for five sessions starting April 19th. I was very surprised as I was more or less told that I would not be getting it. Hopefully this will help. Vel came and was a bit surprised at the way I was walking. I brought him up to date from the last few days. He said he would not touch my neck and shoulders at all today, as he thinks that it will make things worse. He massaged my knees both which are still swollen I told him they had gone down a little. We both agreed that the ACUPUNCTURE was working better than the just the massage. Vel said that this would be the last time he would visit me as a patient. The clinic at Carholme Court where I was going will not be taking patients again. Vel will cover the wards and a few home visits. I will miss him a lot. I did not think my visits would last long. Now, I have no one. If I had any other conditions I would get lots of help but not with RSD. Vel is going to write to my Doctor to ask him to send a letter to Pain clinic to keep the ACUPUNCTURE going long term as short term does not have the same benefit. Also try to get HYDROTHERAPY this was mentioned before but nothing happened. The last few weeks have bean very difficult and more painful. A lot more spasms. I try to keep going, but it hard. I read on an RSD site, that for some reason, that RSD can make you live longer. But do I want to live longer with RSD? My head is a bit better but still more body pain than I would like, but what can I do take enough tablets to kill the pain and most likely damage myself as well and block out any function that I have. My whole life revolves round pain. Pain follows pain follows pain.. I am putting bubble wrap around the green house to keep in some of the warmth. Generally on the whole I feel a little better in mind and body. The last six months have bean quite hard with the hospital stay, Wietse going and now Vel. He will leave a big gap. At least the weather has bean nice more Summer than spring. Saw Dr Meta told him about everything that had being happening. He said I could of had a virus or infection. That would have made everything worse or just a flair up of RSD. He is putting me on some muscle relaxants, ZANAFLEX hopefully they will help, one a day then increasing slowly up to nine limit. I hope it does not come to taking nine. This is just about the strongest one I can take without being in hospital and monitored. DIASIPAM was mentioned but he said not for me I had them when in hospital and they sent me almost crazy. He thinks I have become used to BECLOFEN. Instead of increasing it will try a change. I am reluctant to take them after the hospital blunder where they increased them too fast and paralysed me. Went to the chemists to get them and they do not stock them. They should be getting them in tomorrow. Pilates - Did the best I could without pushing it but better than last week. Getting dressed is hard at the moment and drying after a bath because my arm goes in to spasm when slightly stretched or even just moved some days. Went to see my brother David and his Wife Bev. Their little dog Shandy died recently. She was 16 years old. I know how they feel after loosing Sandy. I brought back a pram for Lindsay as she is having another baby due October 6th. I have not said anything before because she wanted to wait till the 12 week scan and to be sure the baby was alright. Lindsay has bean quite ill with her THYROID getting out of control. She is starting some more treatment so hopefully things will start to improve. Got my ZANAFLEX now. Took my first one, very weird side effects, like 3D without the glasses. Faces coming out the television. I had to turn it off not that it made much sense any way. The walls coming in on me, voices all around everything looked so big. A very bad reaction. I dare not stand as I felt like as was in a dream. No, more like a nightmare. Later on the effects passed, after about an hour or more. I went to bed about 4am with no more strange things happening. I still feel a little strange. Ifs that what one does, think what nine would be like - mind blowing. Night time took the second one not as bad this time but still unreal thing going on. I kept thinking this is not real and was able to cope better. In town today with Paul another nice day. Did quite a lot of walking. We took Summer to the vets as for the past week she has bean limping. Not wanting it to get worse we thought it best she went. Once at the vets her leg seemed to improve and she was getting a lot of fuss off the vet. When we said she was limping, she said "really?" When examined she found a sore bit muscular and gave her some anti-inflammatory drops, METACAM. She told us it would have got better on its own but its kinder this way, but not cheaper £30.00. She said to rest her but that's hard as she thinks she is ACTION PUP. We will do our best. Third tablet not as much side effects. I tried to concentrate on my breathing as much as I could to block out the images. I could hear Wietse's and Vel's voices saying breathe Gill breathe (they both said this to me when I held my breath because of pain being inflicted though physio). Well as you can see the past month has not bean the best but things can only get better I hope. Take care every body in what ever you do.